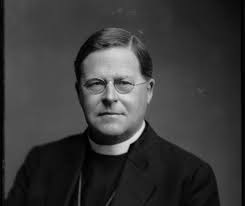 "The Church is the only society that exists for the benefit of those who are not its members"
"The most influential of all educational factors is the conversation in a child's home"
William Temple was born in 1881 in Devon. He was the second son of Frederick Temple, also Archbishop of Canterbury. He was ordained priest in 1909, served as Headmaster of Repton School, was appointed Bishop of Manchester, then Archbishop of York, and in 1942, he became Archbishop of Canterbury. Temple defended the working-class movement and supported economic and social reforms and he was influential in bringing together the various churches of the country to support the Education Act of 1944. His influence led to the formation of the British Council of Churches and the World Council of Churches.